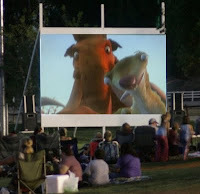 Here are some tips to make the most of your outdoor movie viewing experience. Dress for the Night. As the night progresses temperatures will most likely drop having a jacket on hand and a blanket are great for keeping warm or snuggling your little one. There are many safe and effective insect repellents that you can use to protect your child, including those that use deet, citronella, or soybean oil. Remember to only use products that are approved for children, follow the manufacturer's instructions and wash off the insect repellents when you return indoors. Insect repellents with deet are probably the best and most commonly used. Although it is absorbed through your child's skin, it is generally safe as long as the product has less than 10% deet. Apply repellents only to exposed skin and/or clothing (as directed on the product label). Do not use under clothing. Do not apply to eyes and mouth, and apply sparingly around ears. When using sprays do not spray directly onto face; spray on hands first and then apply to face. Do not allow children to handle the products, and do not apply to children's hands. When using on children, apply to your own hands and then put it on the child. Do not spray in enclosed areas. Avoid breathing a repellent spray, and do not use it near food. Use just enough repellent to cover exposed skin and/or clothing. Heavy application and saturation is generally unnecessary for effectiveness; if biting insects do not respond to a thin film of repellent, then apply a bit more. After returning indoors, wash treated skin with soap and water or bathe. This is particularly important when repellents are used repeatedly in a day or on consecutive days. Also, wash treated clothing before wearing it again. If you suspect that you or your child are reacting to an insect repellent, discontinue use, wash treated skin, and then call your local poison control center. If/when you go to a doctor, take the repellent with you. Make sure to keep as much of her skin covered with clothing as possible, including long sleeve shirt, long pants, socks, and a hat. Wear light colored clothing, so as not to attract bugs. Avoid using any scented soaps or other products on your baby, since the fragrances can also attract insects. Apply insect repellents to clothing instead of to skin so that it won't be absorbed. Follow the instructions, including age restrictions on any insect repellent you are considering using. Hoboken's "Movies Under the Stars" is back this summer. These FREE outdoor movie screenings take place at Pier A Park, overlooking the Manhattan skyline. Movies begin at 9:00 p.m. in June and July and around at 8:15 p.m. in August, unless otherwise noted below. For the best seating, come early and bring a blanket or comfortable low-back chair. Schedules are subject to change. In case of heavy rain, the film presentation will be canceled and rescheduled on Aug. 20 and Aug. 27 at 9:30 p.m. following the regularly scheduled film at 8:15 p.m. For further information call (201) 420-2207 and keep checking Hoboken Now all summer long for film schedules and reminders! Fort Lee Film Commission Presents the 2009 Movies Under the Stars at Constitution Park (Linwood Avenue). This summer long outdoor film festival highlights the films of the 1930s this year. Film goers are encouraged to bring canned good donations for the Fort Lee food bank. All programs start at 7Pm and films screen at sunset. Bring lawn chairs / blankets. 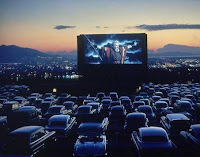 The peak years for Drive-ins were the mid to late 50's. New York's peak season was '63, with over 150 Driveins lit-up that year. Since then, the state has experienced a rate of attrition and decline of 82%, but yet, NY remains one of the top 5 Drive-in states, with nearly 30 Drive-ins that remain lit currently & seasonally.